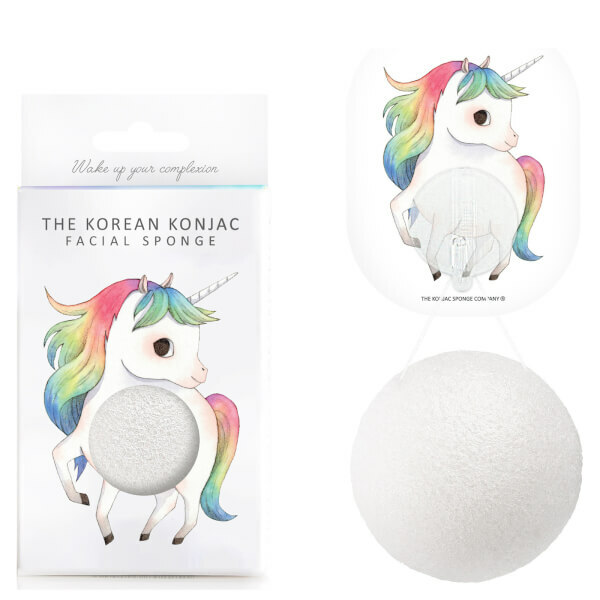 Discover the original, award-winning formula in new, magical packaging with The Konjac Sponge Company Mythical Unicorn Prancing Konjac Sponge Box and Hook. 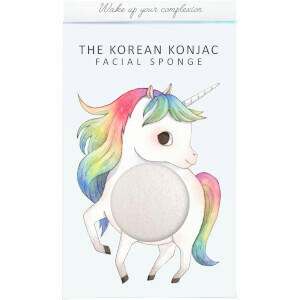 Arriving with a colourful unicorn hook to hang up your sponge, the skincare tool has been hand-made in the volcanic hills of South Korea and is 100% natural. Ultra-gentle and lightweight, the sponge smooths over skin to deliver a deep cleanse and a surface exfoliation, sweeping away dirt, impurities and dead cells to leave behind a fresh and glowing complexion. Biodegradable and eco-friendly, it uses a nourishing combination of Konjac plant fibres and Volcanic Water to soothe and revitalise skin. Vegan, cruelty-free and 100% natural. Fully hydrate your sponge in warm water until soft and squishy, then massage around the face in circular motions for a deep cleanse and gentle exfoliation. You can use a cleanser with your sponge or on its own. After use, carefully squeeze out excess water and hang by its string on the hook provided.